Senior Josh Perkins is the only starter remaining from the Zags' 2017 Final Four run. The Gonzaga Bulldogs head to the NCAA Tournament for the 21st consecutive season hoping to pull off something the program has never done: win it all. This year's team is quite possibly the best equipped in Gonzaga history to do just that. They're arguably the most efficient offensive team the sport has ever seen and indisputably the most efficient squad this season. Advanced metrics rate this year's group even higher than the 2017 team that made the Final Four. March is the month of madness though. Gonzaga, like every team in the tournament, is both vulnerable to an upset and capable of a deep run. Here are three things the Zags need to do in order to avoid the former and achieve the latter. Some teams are defined by the speed at which they play. Conference rival BYU, for example, used to be known for its fast and furious, run-and-gun approach to offense. Virginia, on the other hand, uses stifling defense to slow games to a crawl. Under Mark Few, the Zags have generally been an uptempo team, but one that falls closer to the middle of the pack than the leading edge. This year, though, they're going faster than ever. The average offensive possession this season for the Zags lasts just 14.6 seconds, according to stat-guru Ken Pomeroy. Only five teams in the country take less time than Gonzaga. It's worked for the Zags as they're the most efficient offense and highest scoring team in all of college basketball. To counter this, opposing teams have often opted to slow the game down rather than try to run with the Zags. For West Coast Conference teams, that proved impossible. But for more talented NCAA Tournament teams, the task won't be quite as tough. The best way for Gonzaga to avoid this problem is to simply avoid teams capable of doing it. Root for teams like Virginia and Cincinnati, who play slow and stout defensive styles, and teams like Texas Tech and Michigan, with length and quickness that limits transition opportunities, to land on the opposite side of the bracket. Or, better yet, fall victim to early-round upsets. If the Zags don't get that lucky, they'll need to take matters into their own hands. Mark Few has employed a 1-2-2, three-quarter-court press at times this season in order to speed up opposing teams. Gonzaga's only played in a handful of close games this season, and there's a common thread connecting each of those games. Only eight teams managed to average one-point-scored per possession, or more, against Gonzaga during the regular season. They include Tennessee and North Carolina, who beat Gonzaga, as well as Illinois, Washington, Duke and Creighton, which were all close games. More recently, San Francisco and San Diego did as well. The only times this season that Gonzaga has looked vulnerable have come when the Zags haven't played well on the defensive end. 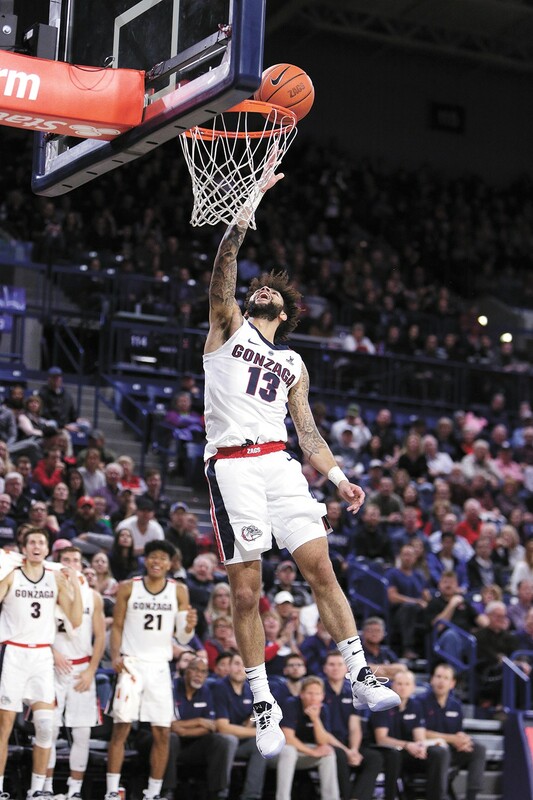 After those back-to-back losses in December, the Zags retooled their defense and have transformed into one of the nation's best teams on that end of the floor. But from here on there's not going to be an opportunity to learn from a loss. One bad defensive performance could end Gonzaga's season. What does Gonzaga have in common with seven of the nine teams to win a national championship so far this decade? The answer is Josh Perkins. Since 2010, only Kentucky (2012) and Duke (2015) have won it all without an upperclassman running the offense. Perkins has been absolutely stellar this season, so there's no reason to expect anything less from him down the stretch. He's also shown that he's more than capable of stepping up in big moments. He scored 13 points in the 2017 National Championship and posted the second highest offensive rating of any player in the game. He's also the only starter left who played in that game. For a program that is always making deep runs in March, this team has a handful of guys in the rotation who haven't ever experienced anything like that. The freshmen never have, obviously. But neither has junior Brandon Clarke. Senior Geno Crandall's only ever played in one NCAA Tournament game. That was back in 2017 with his former team, North Dakota, and it was the program's first-ever trip to the tournament. Pretty different this time around. The lights are brighter at Gonzaga, and they get even brighter when the Zags go dancing. The arenas get bigger, too. Sometimes they aren't arenas at all, but rather gargantuan NFL stadiums. The original print version of this article was headlined "Road to the Final Four"